Penguin Vacation Video Slot Guide & Review - Casino Answers! Penguin Vacation is a 5-reel, 20-line video slot developed by Playtech, featuring wild symbols, scatter wins, multipliers, a gamble feature, free spins and a bonus game. You can play the Penguin Vacation video slot at Titan Casino and Vegas Red Casino. To play the Penguin Vacation slot machine, you must set your coin value at $0.01 or $0.05. Once you have your coin size set, you can choose 1-10 coins and 1-20 active paylines. The lowest total bet you make on the Penguin Vacation casino game is $0.01, with the highest total bet being $10 per spin. 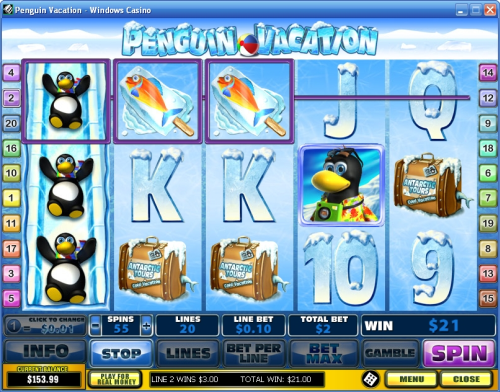 Penguin Vacation is perfect for low stakes slots players. To play all 10 coins on all 20 paylines, use the “Bet Max” button. To play Penguin Vacation with your wagering settings, use the “Spin” button. To win the 10,000 coin top jackpot on the Penguin Vacation video slot, you must have 5 Penguin Ice Slide wild symbols appear on an active payline. The Penguin Vacation wild symbol substitutes for all symbols except for the scatter symbol. It is stacked on all reels, meaning you can get 3 wild symbols on a reel, thus creating lots of possibilities for winning combinations. Also, when completing a winning combination, it will double your winnings! Another feature in Penguin Vacation is the gamble feature. After any win, you can activate the gamble feature by using the “Gamble” button. The game is simple. You will have to choose whether the facedown card will be red or black. You may play up to the double up limit, which in the case of most Playtech casinos should be $1000. To exit the gamble feature, use the “Collect” button. There are even more in-game features on the Penguin Vacation slot game. There is a basic autoplay mode where you can play up to 99 spins automatically. You may cancel the autoplay mode at any time. There is also a skill stop feature that can be used to stop the reels mid-spin. 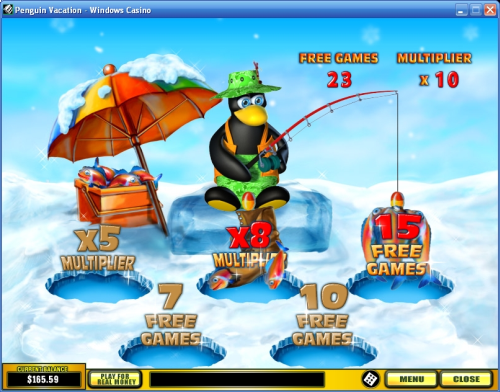 Penguin Vacation has a fun theme, great graphics, a very attractive top fixed jackpot and some great special features. If you’re looking for the right online casino to play Penguin Vacation at, we recommend Titan Casino for its $4000 signup bonus, top-notch customer support and live dealer games. Play Penguin Vacation now at Titan Casino! Are USA players able to play the Penguin Vacation slot game? Unfortunately, American players are not welcome at Playtech online casinos at this time. However, if you just can’t get enough of those cute little flightless birds, head over to Winpalace Casino to play the USA-friendly Penguin Power slot game there. How do I win free spins on the Penguin Vacation slot machine? To win free spins in Penguin Vacation, you must get three scatter symbols anywhere on the reels at the same time. Automatically, you will win 8 free spins and a 2X multiplier (meaning all of your winnings during free spins will be doubled). From there, you will enter the Fishing bonus game where you will be able to select two of the five available spots to win up to 33 free spins and a 15X multiplier. During free spins, you will be able to win 15 more free spins whenever 3 more scatter symbols are hit. What is the best place to play the Penguin Vacation online slot game? We recommend you play the Penguin Vacation slot game at Titan Casino or Vegas Red Casino. For more details, you can read our full review on Titan Casino. What are the payouts to the Penguin Vacation Video Slot? How do I activate the Penguin Vacation Video Slot bonus guide?